The text he used is from the daily office sung or said in the Cathedral, much of it in Latin. Consequently Stephen chose words such as 'Hosanna in excelsis', 'Dominus Deus', 'Sanctus, Sanctus, Sanctus', 'Jubilate' for laser cutting in the walnut vaneer MDF for the shades. Practically every letter is slightly different depending exactly where it lets the sound out from the 4800 pipes hidden inside the instrument. 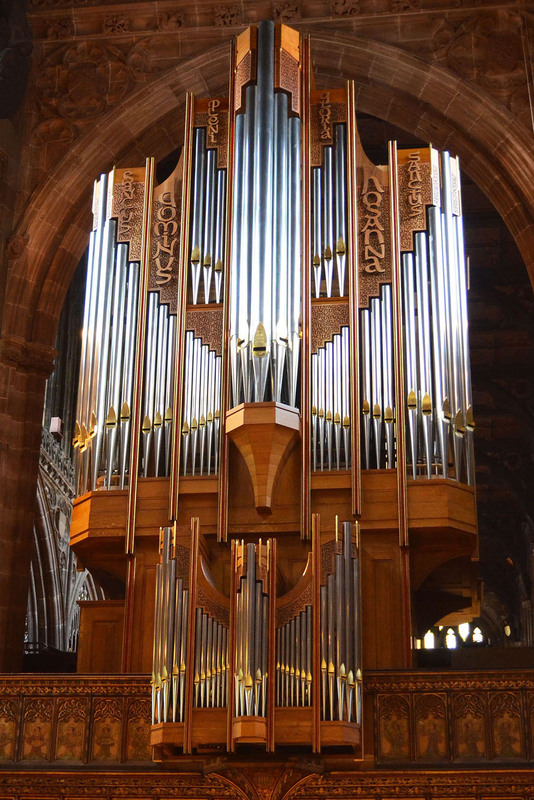 The 'Stoller Organ', as it is known after its benefactor, replaces the temporary one put in after the Blitz had damaged the original one beyond repair.